Happy 93rd birthday, Bob Montgomery! Even on his 93rd birthday, Robert “Bob” Montgomery is hard at work today on the fifth floor of a building on Fourth Street, taking on a job a precious few still do. 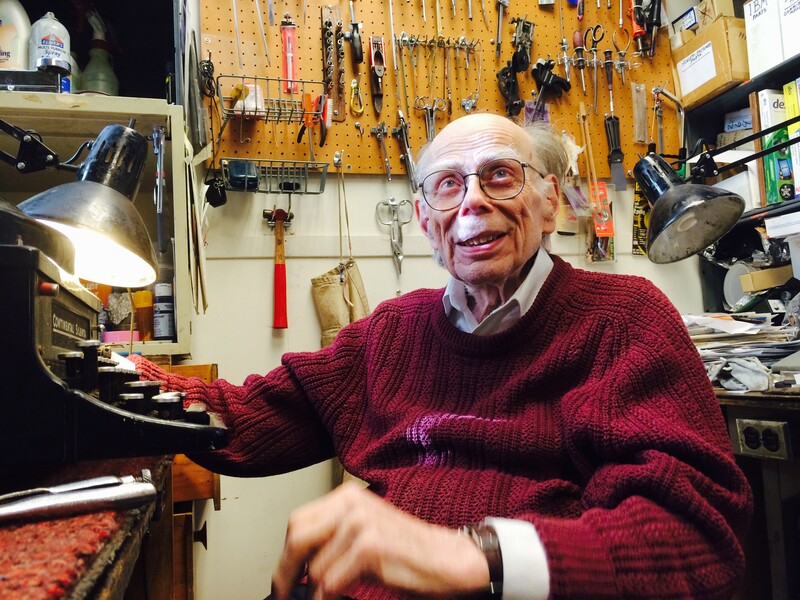 Granted, the typewriter repairman — in business for almost 70 years in Bremerton — had some well wishers today, including Don Feldman. Feldman, a collector of old typewriters, dropped him off a present: a German-made Continental Silenta. Montgomery has many great stories to tell. Last year, Bremerton Mayor Patty Lent proclaimed March 12 “Bob Montgomery Day,” for his many contributions. He’s also been active in the theater community since 1950. The Seattle Times penned a piece about him last year as well. He is, in short, a Bremerton legend.